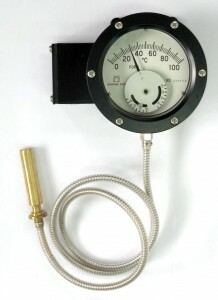 The insides of the thermo-sensor cylinder, capillary, and Bourdon tube are filled with liquid which changes volume with varying temperature. The liquid in the thermo-sensor cylinder is expanded and contracted as the temperature changes, and the pressure change in the Bourdon tube that is transmitted through the capillary is indicated as a temperature. Since the displacement of the Bourdon tube due to an internal pressure change is directly indicated on the scale division plate without passing through the transmission mechanism and expansion device, this product is excellent in vibration resistance. This product is provided with an electric contact that operates the micro switch. Withstand voltage AC2000V for 1min.